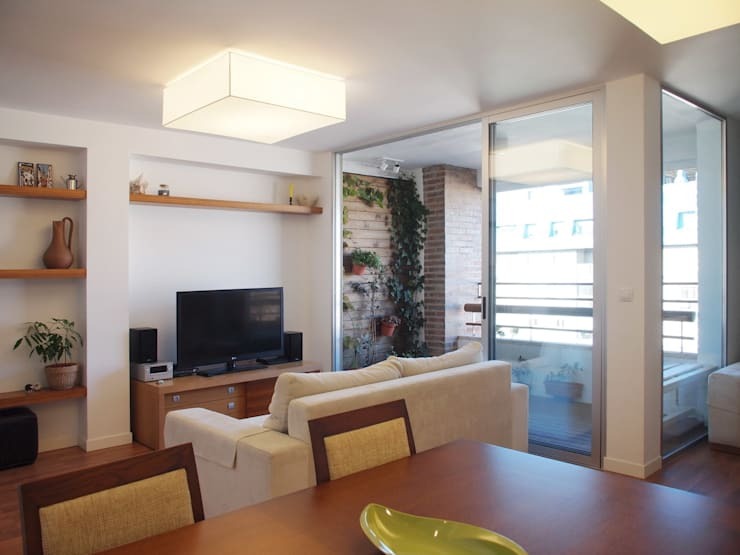 The living space was a drab area of the apartment which definitely needed some life. The room was spacious and could have been amply illuminated with natural light. Since this room opens out to a balcony, the possibilities were endless. The balcony also had lifeless white walls devoid of any aesthetic features. The plain walls in the living room lacked contrasting elements or points of visual appeal or focus. So how was this 'plain Jane' made attractive? Now the room is wholly alluring! There is light, air, decor and colour – all the elements that were missing earlier. The walls demarcating the balcony from the living area have been torn down to integrate the two spaces in a visually appealing manner. The living space now accommodates comfortable sofas, a sleek entertainment unit, and also a chic wooden dining table. The wall opposite the white couch features simple open shelves which display artworks, artefacts and potted greens. A bright geometrically-inspired ceiling light livens up the space in the evenings. And during the day, sunshine streams in through the glass doors separating the balcony from the living zone. This is the ideal room to bring together the family! The reworked shaded balcony surely deserves a closer look. Slim wooden panels line the floor and exude a warm and cosy feel. 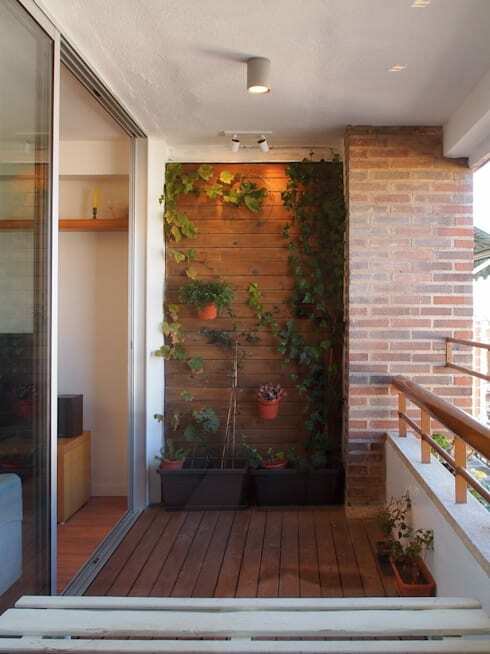 Some potted plants and vines glorify the red brick and add a hint of nature to the balcony. Clever and gentle focused lighting further enhances the beauty of the vertical green wall. This is a perfect place to sip your cuppa, as you survey life passing by. 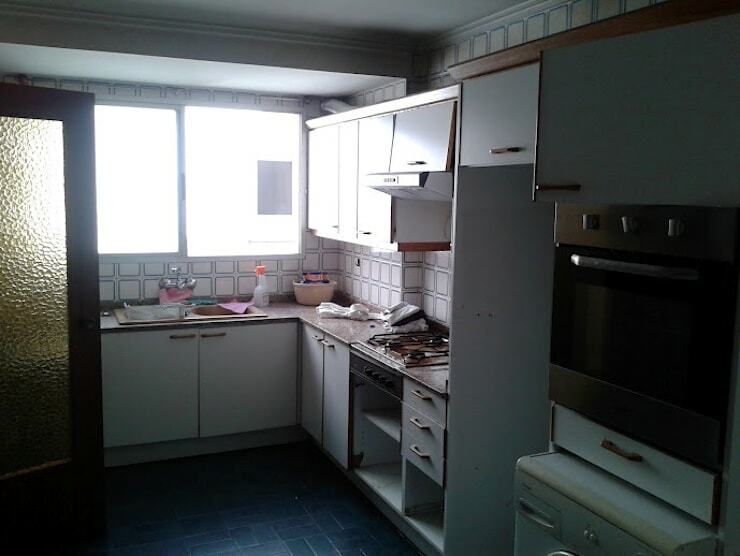 Now the kitchen looks remarkably spacious and clean, and quite unlike what we saw before! The first noticeable aspect is the space and the decluttered serenity. 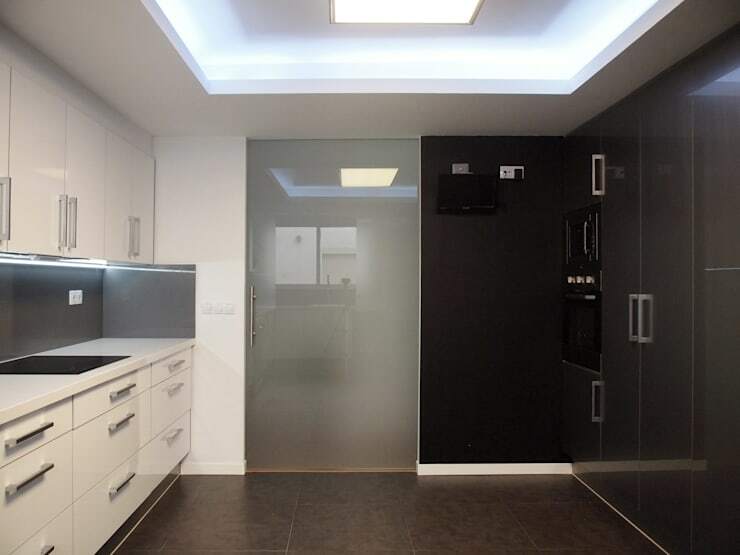 The skylight adds to the bright feel of the kitchen and makes it cheerful. The brilliant track lighting helps too. The architects have smartly changed the colour of the cupboards to a lighter shade, further creating some visible appeal. The kitchen now sports adequate storage options on both sides to house all appliances, crockery, cutlery and so on. Larger tiles on the floor in a warm shade of brown augment the style quotient further. A frosted sliding glass door partitions the cooking haven from the hallway outside. 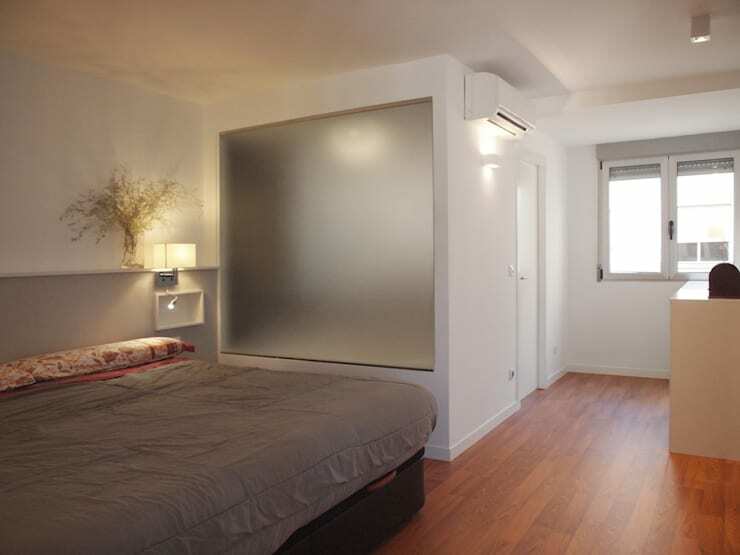 With this transformed bedroom, the architects have succeeded in their experiments with style. What was once a concoction of just four walls is now the essence of contemporary functionality and flair. While the comfortable bed does catch the eye, what vies for attention is the masterpiece of a bathroom. Translucent glass has been used to create a small personal cubicle-like effect for the bathroom, and this enables privacy too. The bedroom’s warm wooden flooring brings a touch of colour and adds to the richness of the décor. Subtle lighting and a couple of indoor plants create the right ambience for a restful room. Geometric precision is the basis of the style quotient inside this bathroom. The dank space that had no individuality has now become the place in which one would love to rejuvenate. Elegant wooden cabinets hold a chic wash basin that looks like it has been chiselled to perfection. 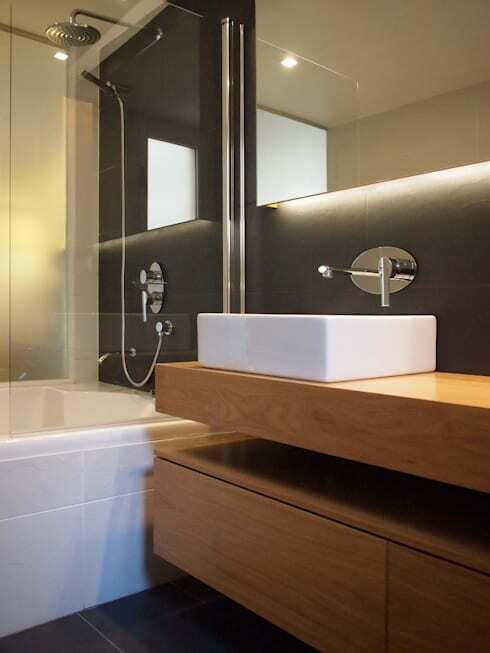 A large tastefully back-lit mirror lends a feeling of spaciousness to the bathroom. A luxurious tub and shower add to the inviting warmth of this space too. 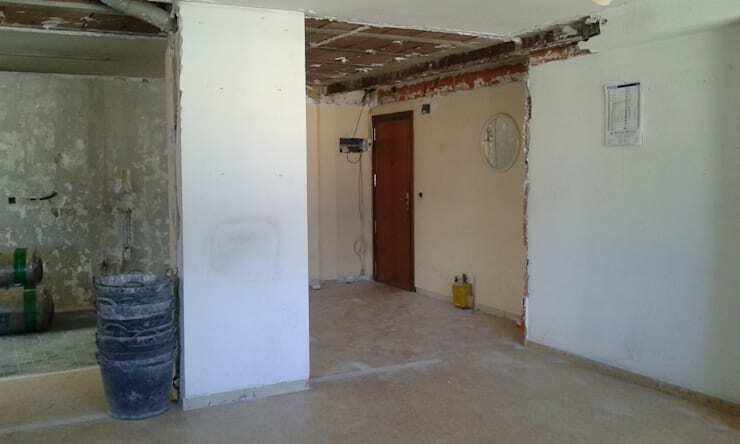 The renovated apartment is now ready to be the warm home of a small family that enjoys its time together. Kudos to the architects for bringing harmony, style and comfort to this abode! For another inspiring makeover, take a look at Before and after: a Korean brick home reborn. Which of the new rooms do you like the most? Has this inspired you to make over your apartment? Let us know!